Today at the Apple World Wide Developer Conference, Apple unveiled the next version of the mobile operating system called iOS 12. This version includes numerous improvements and features and will be available on all phones that are currently able to run iOS 11. Below we have outlined all of the new features that you can expect from the upcoming iOS 12 operating system due out in the fall. iOS 12 will be available on iPhone 5s and later, all iPad Air and iPad Pro models, iPad 5th generation, iPad 6th generation, iPad mini 2 and later and iPod touch 6th generation. The keynote is also at the end of this article for those who wish to see all the features demonstrated at the WWDC 2018. While apps and features are great, we want a device that responds quickly and smoothly. According to Apple, iOS 12 has been optimized to launch the Camera 70% faster, reveal the keyboard 50% faster, and to make apps launch twice as fast. iOS 12 will also predict when you need an increase in performance based on your action and quickly increase the CPU as needed and then reduce it when it isn't in order to preserve battery life. In an announcement that must have House party a little nervous, iOS 12 will have updated Facetime that allows group video calls. Even crazier, Apple has stated that up to 32 different people can take part in a group video chat at the same time. A new feature called Shortcuts allows an app to integrate themselves into Siri. Apps can now be programed to extend their functionality into Siri so that you can issue voice commands related to them. For example, the Tile app can be integrated into Siri so you can say "I lost my keys" and have Siri communicate with Tile to locate them. 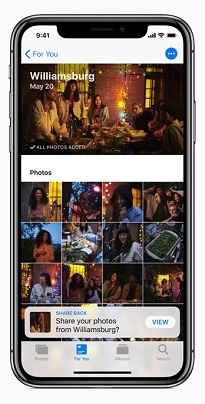 Photos have received an updated search that allows you to search for pictures by events, places, people, groups, and categories. A new "For You" tab has also been added that puts all your favorite pictures, memories, and shared folders in one location. For You can also recognize people in images and provide suggestions as to who you should share images with or what photos to share back with another person. Apple has teamed up with Pixar to create an Augmented Reality file format called USDZ or Universal Scene Description. This file format allows developers to include all animations, images and sounds necessary for a Augmented Reality experience in a single file. This file format will also work throughout iOS 12 in apps such as Safari, Mail, Messages, and the Files app. 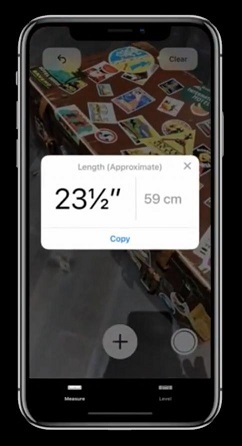 Also shown off as a new app called "Measure" that uses AR to measure objects. While apps like this already exist, having it built into iOS 12 is definitely a useful feature. 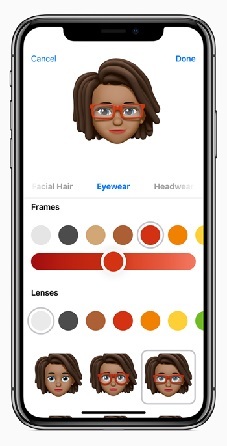 iOS 12 also brings new expressive Animojis such as ghost, koala, tiger and T. rex and "Memojis", which are similar to Bitmojis. Emojis are expressive images that you can customize to look like yourself. Do Not Disturb has been updated so that it can be disabled at certain times, locations, or after certain actions. iOS 12 also gives users more options on how they can manage notifications so that they can be delivered quietly or turned off completely. Screen Time is a new tool that helps you understand how much time you are spending on your device and what you are using it for. This tool also provides reports that a parent can use to see how much time a child is spending on a particular app and allow them to schedule when the device can be used. As more and more people are realizing that their data belongs to them and not a company, Apple has included new privacy features that allow you to take back control of how your data is used. For example, Safari now includes "Intelligent Tracking Prevention" that blocks social media sharing and like buttons from tracking users without their permissions. • "Simplified system information when users browse the web, preventing them from being tracked based on their system configuration." • Automatically creating, autofilling, and storing strong passwords when creating online accounts. Even better, Safari will warn users when they reuse the same password at multiple sites. Update 6/4/18 21:47 EST: Reworded the dynamic CPU performance based on prediction better.